The Sweetheart Baby Blanket takes cuddling to a whole new level. Wrap your little sweetheart in love with this adorable blanket that features seed stitch hearts, sweet eyelets and a simple cable twist border. 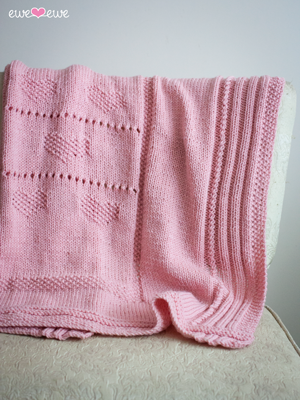 Knit in Wooly Worsted, the Sweetheart Blanket is not only super soft but washable, too!